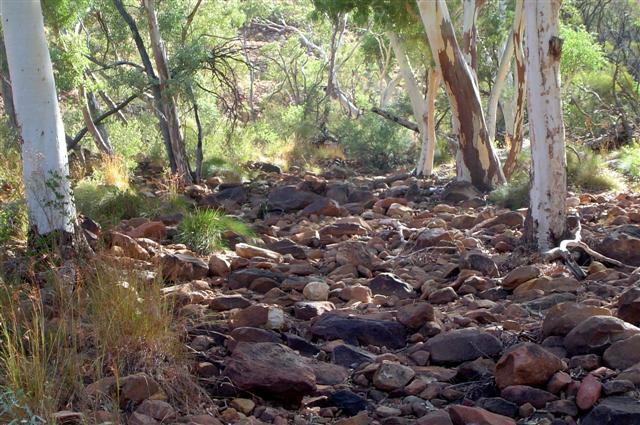 large, clear area just off the road at the Luritja Road turn-off to Kings Canyon. The road into the Canyon is sealed all the way which was surprising as we’d been told that the road was unsealed and rough in parts. Situated in the Watarrka National Park, Kings Canyon is Australia’s Grand Canyon, albeit on a slightly smaller scale. The canyon is a sandstone chasm that plunges 270 metres (886 feet) and the canyon floor boasts luxuriant cycads around a waterhole in the aptly named Garden of Eden, an exotic oasis in the desert. 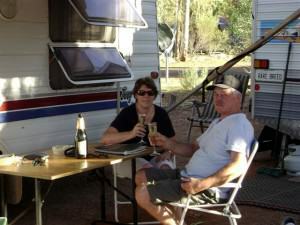 We checked in at the Voyager Kings Canyon Resort ([star][star][star][star]) and were given directions to the camping area where we had our choice of campsites. Choosing a site facing the canyon wasn’t difficult as, we discovered, they all face the canyon, and we soon had the camp set up. The Resort is a great place although we were surprised to discover that there is no mobile phone or internet service other than satellite. Not that that bothered us, it just seemed strange. It was way too hot to do much of anything this afternoon but we drove up to the sunset viewing platform for a closer look at the Canyon. 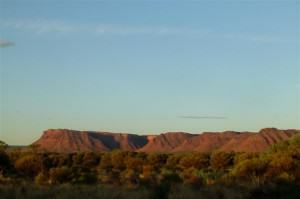 As the sun started to go down the canyon walls glowed with that red iron oxide that is so prevalent in the outback. A light breeze sprang up that evening as we settled in with our bottle of Two Tails Sparkling Wine for our first night bubbly but it was still uncomfortably warm. anything not nailed down. They’re particularly fond of shoes and always the right one; don’t ask me how they know the right foot from the left foot but they always take the right shoe. Feeling very enthusiastic, I got up early to photograph the Canyon at sunrise but I think I was a little too enthusiastic and a little too early; the shots weren’t that good. 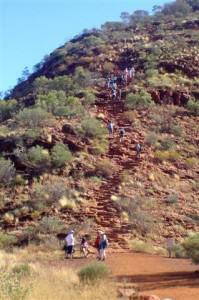 There are a number of different walks into and around the canyon including the famous Canyon Rim Walk. This is the one in all the travel brochures where people are standing right on the edge of the canyon rim to have their photo taken. Not really my cup of tea and we decided to do the 1.5 kilometre (approximately 1 mile) Kings Creek Walk instead. Kings Canyon and Kings Creek are part of the George Gill Range and Kings Creek, in particular, is of special significance for the Luritja Aboriginal people who are the Traditional Custodians of Watarrka. How spectacular it all is! 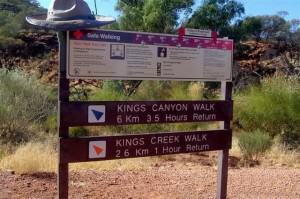 At the start of the path there is a memorial to Jack Cotteril who opened Kings Canyon to tourism in the 1960’s.The path wound past the start of the Canyon Walk and I was so glad we weren’t doing that one; that climb was almost as bad as climbing Uluru! Definitely not for me! But the walk we were on was stunning. The path meandered up the centre of the canyon beside a dry creek bed and we marvelled at the walls of the canyon towering above us. The large rocks scattered around were chunks of Mereenie Sandstone that had tumbled down from the sheer cliff face above us. It is said that the last major rock fall was in 1930 and I hoped they weren’t due for another one just yet! bridge and some stairs leading to a viewing platform with seats and as we crossed over the dry creek bed we literally felt the temperature drop several degrees; it was enough to make us shiver! We sat on the platform and watched the people from the Canyon Walk up on the rim, far above us. 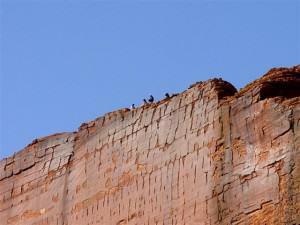 Some of them were walking right out to the edge and even sitting there with their legs dangling over. I wondered if there was a safety fence and if there is, then those people had to be outside of it! You wouldn’t want to suffer from dizzy spells! The viewing platform really is the end of the walk; the sheer walls of the canyon stand in front of you and there’s nowhere else to go but back the way you came. We took our time on the walk back; there was such beauty here that it really needed to be appreciated with a slow walk but it wasn’t long before we were back at the carpark. The afternoon was quite hot and other than a walk around the resort we didn’t do very much. However there seemed to be a change in the weather overnight and a stiff breeze started blowing. We awoke to the sound of raindrops on the roof of the van but it wasn’t many raindrops and I thought we were lucky if it was a dozen or so. In fact I wondered if we had imagined it but a few more drops started falling as we packed up. Kings Canyon is a stunningly beautiful place but other than the canyon itself there’s very little to see and do and, in any case, our time here was very limited. Even so, as we drove away in the early hours of the morning I was glad we’d come. We’d heard and read so much about Kings Canyon that we would have been hugely disappointed if we’d missed it. As it is, the beauty and awe of this place will live with us for a very long time.